(Link to video) For the last installment of my Shanghai series, I'd like to share this video, about a memorable day spent with the art students of the Shanghai American School. 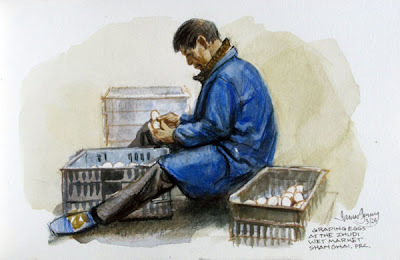 Here's the sketch of the man sorting eggs. And here's the one of the entryway to the wet market. On another -- and much sadder note -- I just received word that my old friend Tom Kinkade passed on this morning. It will take me a little while to absorb the news, but I'll share some thoughts about his life and art with you in a future post. First of all, and most importantly James, I'm very sorry your loss of your friend, Thomas Kinkade. I do know it will take some time for, as you say, this news to sink in for you. Thanks so much for this great video! It's fantastic to view and I only wish for it to be longer (of course). One question: I've been puzzling over the strips of color in the center of your watercolor box (between the rows of color pans). I don't think the box came like that (did it? ), and the colors don't seem to exactly correlate to the colors in the pans. Oh, man, this video makes me trunky for China. I spent two years in Taiwan back before dirt was invented. That trip sounds excellentJames. And to think that they paid your way! One excellent salute to your influence for good. Well done, James. BTW, condolences on the death of your long-time friend Thomas Kinkade. Another great post! 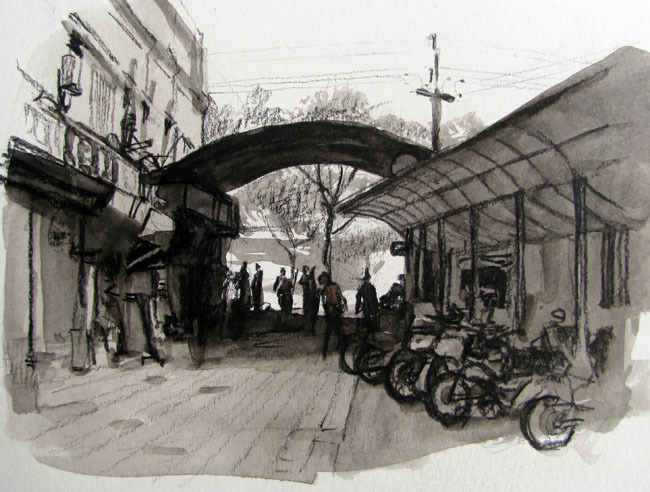 I appreciate the time you take to do these great posts about sketching. I was just recently telling someone that I knew that you and Thomas Kinkade were friends long ago. You both have made major contributions via completely different paths. Kinkade was often disliked by painters, but my friend Irene (age 82) thinks the world of him. I think of Kinkade as a modern day Currier and Ives, he made legions of people happy. My condolences to you. My deepest condolences for Kinkade's passing. It's always sad when the world loses an artist so young--especially when they're both an artist and a friend. I was deeply saddened to hear of Tom's passing last night. I had the pleasure of meeting him back in 2006 and was able to show him some of my work. Tom was very kind and went out of his way to offer me feedback and encouragement. I remember that his eyes lit up when I mentioned your name, James. My heart breaks for his wife and children. I send them and you my deepest condolences. So sorry to hear about Thomas Kinkade's passing away. James, I'm so sorry to hear about Thomas Kinkade. My sincere condolences. On a lighter note, its been great to revisit your visit through your eyes on the website over the past few weeks, and I can't wait to show the students your video of their wet market visit. Thanks again for everything. In America there are two classes of travel -- first class, and with children.